Let’s take a look at how the run-time pieces fit together. At the innermost level, there is a website that the developer identifies by URL. The website is rendered and runs in an Oxide webview. 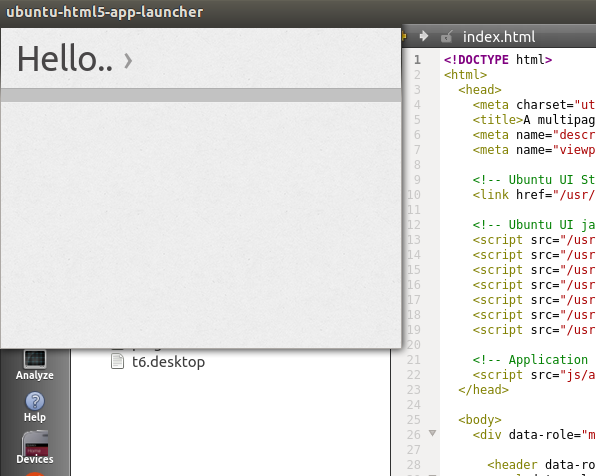 Oxide is a Blink/Chrome webview that is customized for Ubuntu. The Oxide webview runs and displays in the webapp-container. The webapp-container is the executable app runtime that is integrated with the Ubuntu/unity shell. HoweverBoth containment and access to specified external URLs are implemented with URL patterns provided as arguments at launch time. Let’s take a closer look. Tip: Make sure to fully specify the subdomain in your starting URL, that is, use http://www.ubuntu.com instead of www.ubuntu.com. Not specifying the subdomain would create an ambiguous URL and thus introduces security concerns. Note: Only the following options apply to converged Ubuntu. Some websites check specific portions of the web engine identity, aka the User- Agent string, to adjust their presentation or enable certain features. While not a recommended practice, it is sometimes necessary to change the default string sent by the webapp container. The webapp experience is contained and isolated from the browser data point of view. That is webapps do not access data from any other installed browser, such as history, cookies and so on. Other browser on the system do not access the webapp’s data.